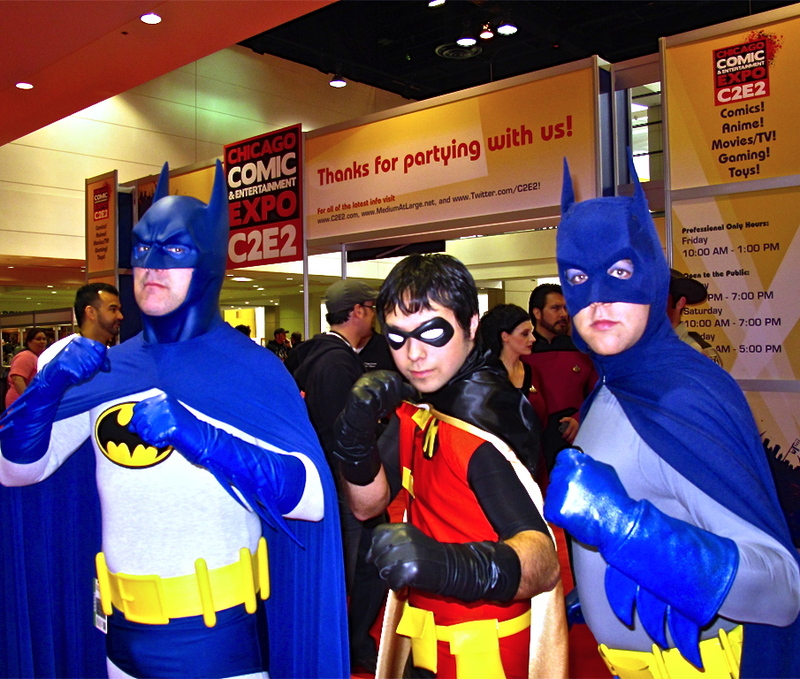 Two Batmans and a Robin at C2E2 2011. Bronies. Homestucks. Browncoats. Whovians. Do these words sound like gobbledigook to you? Welcome to the weird and wonderful world of nerds. The Chicago Comic & Entertiainment Expo (C2E2) is headed to McCormick Place April 26-28, and fans have a lot to look forward to this year. In addition to costume contests and sci-fi speed dating, C2E2-ers will have access to three days worth of panels, screenings and other geek-tastic exhibitions. Spotlight guests include Patton Oswalt, Kevin Smith, Felicia Day, Adam West, Ron Perlman, R.L. Stine and many more. In an earlier post, I referenced what I have coined "the hierarchy of nerdom." Now that "geek" and "nerd" have become positive terms (all but defining pop culture as we know it), the tables have turned. Instead of ignoring or bullying the nerds like they did in high school, grownup hipsters are practically falling over themselves in attempts to prove their ultimate nerdiness. Unfortunately, admittance from mainstream geek chic into the "real" nerd subculture is now almost as impossible as a mathlete getting asked to sit with the popular kids at lunch. The Fake Geek Girl meme has become an outlet for nerds to vent their frustrations at pretty girl poseurs, many of whom just pretend to be geeky so that they can attract their own version of Joseph Gordon Levitt in a sweater vest. Still, the idea that women can&apos;t be as nerdy as men (especially in the gaming community) is sexist as best, blatantly misogynistc at worst. If I had a nickel for every time that someone has told me, "Pretty girls can&apos;t be &apos;real&apos; nerds" or some other nerd-elitist putdown in relation to my gender, then I would have enough money to publish 10 ebooks of dystopian science fiction and build my own Hogwarts castle just to spite them. Yes, women can be nerds too. And although not every self-proclaimed geek may share the same fandom, establishing hierachies of nerdery ("You&apos;re not a &apos;real&apos; nerd unless you watch/read/play X, Y and Z") isn&apos;t much better than dividing up teams for kickball and picking the scrawny kids last. Even if you feel like you&apos;re not "nerdy enough" to attend a convention like C2E2, you might be surprised. Maybe cosplay isn&apos;t your cup of tea, but gaming and graphic novels are right up your alley. Ultimately, we define our nerdom for ourselves, and how we choose to identify within a culture should not be decided by the prejudicial rules and marginalizations of others. At C2E2, everyone is welcome; so whether you&apos;re a newbie to geek culture or a die-hard aficionado of all things nerd, there will be a place at the "cool" table with your name on it. Leah Pickett writes about popular culture for WBEZ. Follow her on Twitter @leahkpickett or join the nerd conversation on Facebook.